This Is Us, The Good Place, and the mystery-box show's new era. Sterling K. Brown in This Is Us; Kristen Bell in The Good Place. Spoilers ahead for This Is Us and The Good Place. This Is Us is a TV show known for making people cry, as the NBC marketing surrounding it constantly reminds us. It’s also a family drama, a series about adoption, and, occasionally, a rom-com. But at its core, it also sits very snugly within another genre: the mystery-box show. This Is Us creator Dan Fogelman has said he originally pitched the series as “a dramedy version of Lost,” making it one of two current NBC offerings—the other being The Good Place—that were directly inspired by what is, perhaps, the ultimate mystery-box show. 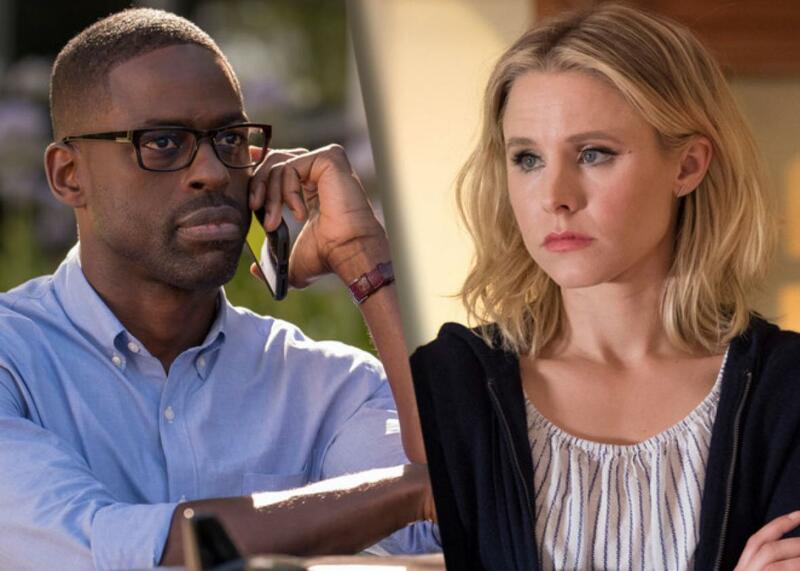 By using Lost as something of a template, both This Is Us and The Good Place demonstrate how this approach to storytelling is evolving. They also prove that, these days, that sort of show may work even more effectively when it’s merged with a type of television that doesn’t traditionally lend itself to dark mysteries and post-episode fan theorizing on Reddit. The Leftovers is a mystery-box show. So is the original Twin Peaks and Twin Peaks: The Return, which, before Lost did, used a basic question—“Who killed Laura Palmer?”—to launch a thousand others about a seemingly mystical place. Westworld, the HBO sci-fi Western about an amusement park designed with robot hosts and a maze, is definitely a mystery-box show, and to a certain extent, Mr. Robot, is, too. Black Mirror, while an anthology series, certainly fits the bill as well. What these shows have in common are settings with heightened or fantastical elements; a narrative approach that slowly reveals information in a manner akin to peeling the layers of an onion; and an association with a genre known for trafficking in uncertainty. Murder mystery, sci-fi, cyberthriller, fantasy—we expect the creators of shows in these categories to thread a whole bunch of initially inscrutable story lines through needles. From the very first episode, when it took a whole hour for viewers to realize that the babies delivered to Jack and Rebecca Pearson in the 1970s were the same people we were seeing as adults in the present, the show has been hitting us with twists that get us a layer closer to understanding the central issues in this family. But of course, there are always more layers. Which is why it’s season two and, although we know—spoiler alert—that Jack most likely died in a fire, we still don’t know why or how and probably won’t until the end of season two. Because it doesn’t look like a mystery-box show on the surface, This Is Us, at least in season one, was able to execute twists that were far more surprising than anything that happened on Westworld. That’s because the audience was simply not expecting that sort of thing from a study of familial relationships. That’s also true of The Good Place, even though its mystery-box architecture was a bit more obvious from the get-go. Like Lost, it’s about someone landing in a place (the afterlife) that she’s slowly trying to understand at the same time that we are trying to wrap our minds around how its engine runs. But because it’s a comedy, we were not necessarily watching it with our antennae up in the same way we do during a Westworld or a Lost. That’s why the ultimate twist—what James “Sawyer” Ford might even call a long con—landed as satisfyingly at the end of season one as it did. It was easy for The Good Place to trick us—again, spoiler alert if you haven’t seen the first season in full—and reveal that the good place was actually the bad place, because half the time, we were so busy laughing at Kristen Bell’s use of the word bullshirt that we weren’t actively anticipating the rug getting pulled out from under us. Which is a good thing. I personally love nothing more than when a TV show or film surprises me. Coming up with theories and trying to figure it all out is fun, but it’s more fun when I’m confident the storytellers are ten steps ahead of me. I think this is potentially more problematic for This Is Us than it likely will be for The Good Place, partly because The Good Place is, again, designed more organically to be a mystery-box show, but also because of its pacing. As a half-hour comedy, especially this season, it moves very briskly and is constantly filling our heads with new scenarios and additional information about what’s motivating all the players, including, now, Michael (Ted Danson). At this stage, creator Mike Schur and his writing staff are moving forward at a point that’s still farther along the path than we are as an audience, in part because they constantly have to keep moving. As an hour-long drama, This Is Us has naturally slower momentum and needs to focus on story lines that aren’t drenched in any particular mystery, like the discussions between Randall and Beth about adopting a child or the inadequacy Kate still feels when she’s in her mother’s presence. Nevertheless, the talk about the series on social media and the culture at large is absolutely dominated by the curiosity about exactly how Jack died and why Kate feels so responsible for it. The longer those details are withheld, there’s a greater likelihood that viewers are going to get antsy and frustrated. Justifiably or not, some people are already expressing such feelings, and we’re only two episodes into the season. Both This Is Us and The Good Place have to walk a weird line, where they continue the mystery-box approach but figure out a way to do it that won’t feel too repetitive or gimmicky. As Mike Schur put it during our recent conversation, “If you play right into their hands and do another big twist, that might be the least shocking thing you could do.” The best way for both series to navigate this conundrum, I think, is to keep doing all the other things they do well, so that even if we’re impatient about what they’re not telling us, we won’t mind as much because there are so many other things to engage with and consider. The Lost backlashers can say what they will about that show, but it was very, very good at doing this. The Good Place needs to still be funny, punny, and simultaneously sarcastic and buoyant, while This Is Us needs to continue to move us and make us care deeply about the members of the Pearson family. We may be watching to get our “whats?” and “whys?”answered, but we’re also watching because we’re invested in these people’s lives … or, uh, afterlives. Not to keep dumping on Westworld, which certainly has its admirable qualities. But I care 1,000 times more about Chidi and Randall than I do about anyone, sentient or not, on Westworld. If This Is Us and The Good Place can keep us caring and still intrigue and surprise us all the way through their second seasons, it’s possible they may become the new default examples for how to do a mystery-box show. That’s the other thing that’s always true about a mystery-box show: When one seems to be working well, all the networks want one almost exactly like it for themselves.